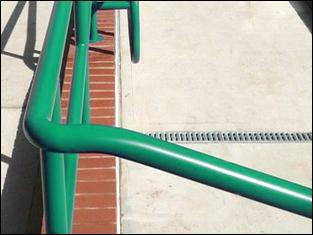 Powder coating with Warm to Touch™ is an alternative to using Nylon for handrails needed to comply with Building Regulations 2004 Part M and BS 8300. 2008 Market welcomes Lodix Insulate™ for Warm to Touch coatings. Windridge Coatings' 2008 patent for a ‘Warm to Touch’ polyester powder coating system improves the insulation properties of its robust corrosion resistant epoxy primer. Incorporated within the Tri-Resin™ System it can be applied without galvanising saving money with improved finish. The availability of different gloss levels and colours including metallics and textures has meant complying with part B is now more flexible than glossy thermoplastic finishes. 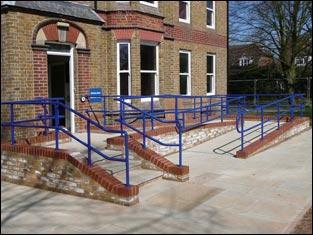 Warm to Touch™ handrails for a school, library, council building, residential care home and train bridges are some examples of where it is being used. Windridge Coatings has the largest box oven in the country enabling large handrails to be made in one piece. This means a smooth, no joints, ‘quick to fit’ option for the fabricator and a pleasing finish for the architect. Left: Warm to Touch™ has the weather resistant smooth finish of powder coating. Thousand combinations for colours and textures. Polyester powder coating has a good proven record for corrosion protection. Powder coating does not fade or crack in sunlight. Right: Community healthcare building, image courtesy of Ashley Light Eng. Lodix insulate™ is incorporated within the Tri-Resin™ System, an established powder coating system which has been protecting thousands of tonnes of steelwork around the country for the last ten years. Using finishing techniques from the vehicle industry, achieving a good finish for Windridge Coatings is second nature. The Tri-Resin™ System incorporates the best practices of corrosion inhibitors, liquid painting and powder coating. It is the way of the future for powder coating and your railing or handrail will look good and be better protected for it. 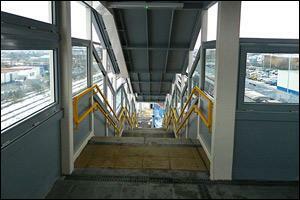 Handrails coated with Warm to Touch™ powder coating has been used on numerous Network Rail footbridges. Image courtesy of Nusteel. Handrails should be supplied not galvanised. To produce the insulation approximately 500 microns of powder coat is applied. This does not cope well with gassing galvanised steel. The Warm to Touch™ Powder Coating is part of the Tri-Resin™ Powder coating System and will offer good corrosion protection.For short runs of under 50m, lengths should be less than 3600mm.